In space, no one can hear you scream — because sound doesn’t travel in a vacuum, but also because you would need some sort of radio relay to carry the message, what with the distances being so extreme. And this goes for any sort of communication. Snapshots of Pluto’s heart, photos from Mars, images of a hellflower bouquet at Jupiter’s north pole: All of it streams back to Earth in a trickle via radio waves, a weak form of light. But that means space communication is limited by a most intractable, most inconvenient law: The speed of light is finite. Since the first satellite launched 61 years ago, spacecraft have relied on radio waves to communicate with Earth. But radio has its limitations. The airwaves are crowded, and what’s worse, radio signals degrade with distance. Facing a constant barrage of beeps and bits from an increasingly busy — and multinational — solar system, NASA and other space agencies are studying how to shore up and speed up space communications. A sort of multifaceted public works project is under way to get space telecommunications into, well, the space age. On Earth, telecommunication is instantaneous almost no matter where you are, and that’s thanks to physics, as well as the series of tubes that make up the internet. Radio waves travel readily through Earth’s atmosphere, and cellular and satellite technology makes it possible to stay connected anywhere. But things get a lot more complicated when you leave Earth. Radio waves become diffuse as they spread across great distances, so transmissions require lots of power and large antennas. And it just takes a long time for them to travel a long way. We can receive 1.5 megabits per second from Mars, which is an average 200 million kilometers from Earth. From Pluto, 7.5 billion kilometers out, download speeds are more like 1 kilobit per second. “It takes 1,500 times longer to download an image from Pluto than from Mars,” said Stephen Lichten, manager for special projects at NASA’s Jet Propulsion Laboratory. We can send robots beyond the outer reaches of the solar system, but they still communicate essentially at dial-up speeds. Last year, NASA’s Mars program manager told scientists that the agency was concerned the network would be overloaded in 2020 and 2021 by a flotilla of Mars missions, which included probes from SpaceX, India, the United Arab Emirates, the European Space Agency and NASA. In response, Lichten said, NASA made a host of upgrades and changes to deal with the load, including working with other countries and with Morehead State University, in Kentucky, to use their antennas as necessary. These changes, along with a drop in the number of missions scheduled for 2020,2 have allayed most of NASA’s worries about a Mars traffic jam, Lichten said. Still, the capacity issue isn’t going away, so updates to the Deep Space Network antennas are underway to help. “There is always going to be more demand than there is availability,” said Sonny Giroux, Deep Space Network program manager at Peraton, which subcontracts with the Jet Propulsion Laboratory to operate the Deep Space Network antennas. Peraton and NASA recently developed a program that equips each antenna with four separate deep space receivers so that one antenna can do the work of four. Spacecraft can call home simultaneously, and software sorts out competing streams of data. This means that the nearly three dozen spacecraft out there don’t have to hear the proverbial hold music when they try to ping Earth. Even better solutions are in the works. NASA is already testing a form of interplanetary internet called disruption tolerant networking; it’s basically a system of relay stations that can hold information in transit, serving as a buffer against delays or glitches. Future spacecraft might have their own small relay stations, making it easier for them to wait on hold if necessary. NASA is trying this approach on a small scale for its Mars mission launching next month: It’s bringing along a pair of relay satellites that will send Earth a play-by-play of the craft’s descent and landing. The InSight Mars lander will study the interior and history of the planet when it arrives Nov. 26. Usually, when a mission like InSight is preparing to land, it would use the Mars Reconnaissance Orbiter or Mars Odyssey orbiter as a relay station to Earth. But those two satellites won’t be able to help this time, because they won’t be in the right geometric position to transmit straight to Earth. So, the two relay satellites, known as Mars Cube One, will act as radio relays, said Andy Klesh, an engineer at the Jet Propulsion Laboratory who leads the Mars Cube One mission. The satellites will receive InSight’s beeps and tones as it descends and then volley them back to Earth so that its human managers can ensure that everything is fine. Humans could just wait an hour to find out if the $1 billion spacecraft is OK. But nobody wants that, and more expedient information might be vital to helping the craft land safely (or understand what went wrong if it doesn’t). The Mars Cube One satellites are 14.4 inches by 9.5 inches by 4.6 inches (about the size of a Costco cereal box), much smaller than a typical satellite, and are relatively cheap. If all goes well, similar tiny, inexpensive relays could be used to monitor new missions on Mars or the moon, where orbiters are scarce and often overworked, lacking the time or bandwidth to serve as dispatchers. While radio antennas remain the backbone of space communications — for now — the future is in lasers. Laser communications systems encode data onto a beam of optical light (as opposed to radio wavelengths) and then transmit it between spacecraft and to Earth. Focused laser light operates in wavelengths 10,000 times shorter than radio waves, meaning that lasers can pump out more information per second. As a result, laser data-transfer rates are 10 to 100 times better than those of radio systems. Lasers are also better at maintaining their signal strength across vast distances. To test new laser-communication technology, NASA beamed this image of the Mona Lisa from Earth to the Lunar Reconnaissance Orbiter at the moon. Each pixel was transmitted by laser pulse, but turbulence in Earth’s atmosphere interfered with some of the transmissions, which you can see on the left. 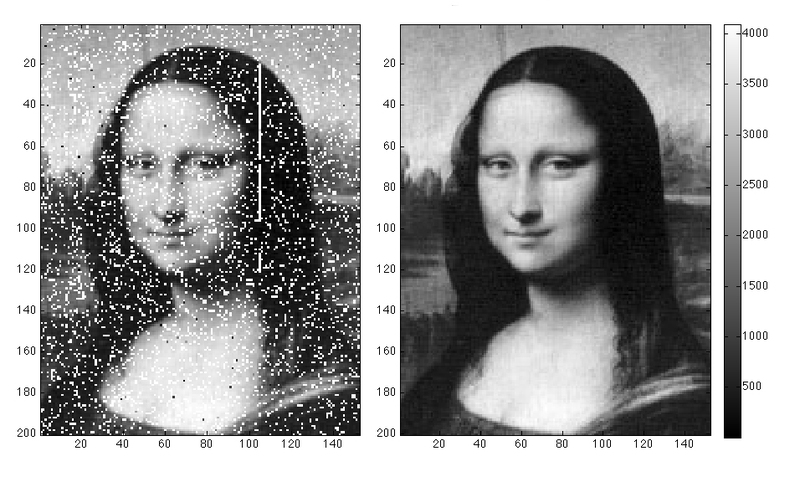 The image on the right shows the Mona Lisa’s visage cleaned up using an error-correction program. The technology was first tested on the moon in 2013, when the Lunar Reconnaissance Orbiter received an image of the Mona Lisa while simultaneously scrutinizing lunar craters and terrain. The transmission marked the first time that scientists had used a laser to send information across space. But NASA still needs to test it on a broader scale. The Laser Communications Relay Demonstration mission, launching next year, will do just that by beaming data to and from a satellite. It will be closely followed by the Psyche mission, which is traveling to the dark heart of an asteroid and, like InSight, is bringing a play-by-play caller. Psyche’s Deep Space Optical Communications experiment will test a new deep space optical transceiver and ground data system that uses near-infrared lasers to send data back and forth. But that won’t launch until 2022. “Knowing how many national space agencies are looking at the moon rather than Mars, this is something where the U.S. could lead us beyond the Earth-moon system again,” Neal said. As in all things, money may dictate the future of the Deep Space Network, and all space communications. Lichten said the network’s operators are constantly juggling maintenance and upgrade needs to stay within the program’s budget. “The DSN has been extremely reliable, but it takes constant vigilance to keep it that way,” he said. There’s also the Near Earth Network, which facilitates communication between satellites in low-Earth orbit, and the Space Network, which uses a combination of ground stations and tracking satellites. Mars and Earth are at their closest approach roughly every two years, so Mars launches are scheduled to catch the shortest distance between the two planets.